My success story began about 6 months ago, when I started the Career Pathways Program through Mrs. Lataschya Harris At NPCC. I started tutoring for two hours on every Monday, Wednesday, and Friday for six months. Then I went to the Adult Education Center where their wonderful staff and tutors gave me the knowledge and support I needed to feel confident enough to take the GED test. I passed my GED test the first time I took it. My hard work paid off. After not going to school for over 8 1/2 years, this made me very proud. I am so grateful for the help that I received. Thank you Mr. Larry Natt, Sr. There is no one like you! Thank you Mrs. Sharron and Mr. Douglas. You both are such an inspiration and a wealth of knowledge! Thank you to all of the staff at the Adult Education Center on Grand Avenue. I will most definitely use this diploma in furthering my education. I’m not stopping here! Many doors have opened for me, and I will never regret a single second it took to get my High School Diploma. On August 22, 2012, I stepped through the doors of the NPCC Adult Education site on Grand with a load on my mind. My daughter and son-in-law were living with me awaiting the eminent delivery of my first grandson. This one event caused both inspiration and stress for me to get my GED. While I was preparing to pass this test, the baby came and woke the household up at all hours of the night. 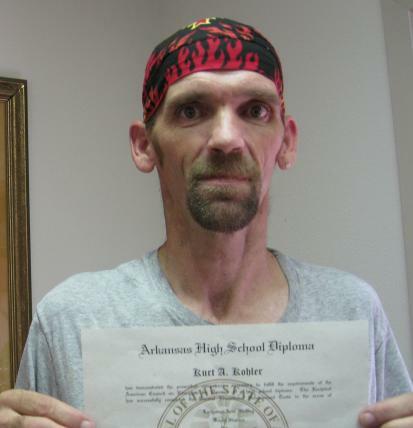 I am almost 47 years old and never had the time to get my diploma until I got to Arkansas. I have always excelled in math and science but had great difficulty in reading and language. This showed in my GED testing, but life lessons helped me to score the necessary points to try the official test. 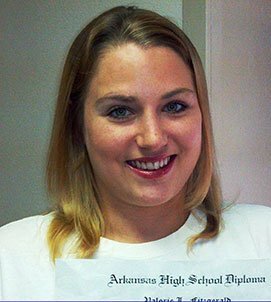 On September 27, the postman handed me a large envelope from the Arkansas Department of Career Education which I was afraid to open. How exciting to see that beautiful high school diploma with my name on it when I finally did open that envelope! Literacy Council of Benton County’s student 54-year old Joe Arnold is a great guy who had a unique start in life. When Joe was a baby, his father was outside holding him when lightning struck Joe’s diaper pin, traveled through him, injured part of his brain and blinded him in his right eye. In his soft spoken manner, Joe talks about going to school. “The kids on the bus made fun of me. They called me ‘retard’ and ‘stupid.’ I wasn’t stupid; it was the brain injury from the lightning that just made it hard for me to learn to read. But I understood things!” Joe stayed in public school until the fourth grade. He was then transferred a school for developmentally delayed or disabled children. At that time there wasn’t much known about teaching people with learning disabilities, and although that school was a great place for a child with Down syndrome or a very low I.Q., there wasn’t much done there to help Joe. He left when he was 15. He still couldn’t read. Joe had no problem getting his driver’s license or his HAZMAT certification, because those tests were read out loud to him. Fast forward to four years ago when Joe came to Literacy Council of Benton County with a goal of obtaining his GED so he could improve his employment. Always hardworking, he was doing physical labor now and was hoping to find something less strenuous as he got older. There were better job options open to him, but he needed his GED. At LCBC he was matched with a great tutor who patiently worked with him, and he did progress, just not as quickly as he would have liked. His tutor asked if Joe had been tested to see if he had a learning disorder. LCBC’s Literacy Coordinator Jennifer Vandiver arranged for Patti White (Disabilities Project Manager with Arkansas Adult Learning Resource Center) to evaluate Joe. Upon her recommendation, Joe was referred to a GED examiner and a psychologist. After their extensive examinations, Joe received approval for accommodations in his quest for his GED. Joe and his tutor got down to some seriously dedicated study sessions, with help from Northwest Technical Institute in Springdale, where Joe took his GED tests. 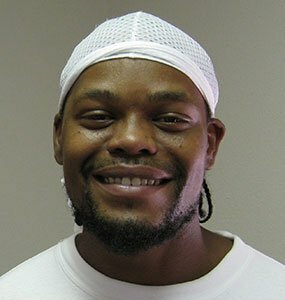 In the first part of April 2011, Joe took the last of the three GED tests. Then he waited. On April 28, his mailbox held his long-sought GED certificate! He will walk the walk in a ceremony in Springdale on June 21, 2011. The kids on the bus were wrong. You go, Joe!